With 200 years of history, Lyra is a company dedicated to providing high quality drawing tools, full of natural pigments in strong wood casing. Their story began in Germany, but since the 19th Century their dedication to their craft has meant that the brand has become known worldwide for their quality materials. Lyra strives to make life more colourful, creative and diverse! Founded in 1806, the Lyra brand was registered in Nuremberg by Johann Froescheis as a pencil manufacturer. Up until this point, Nuremberg's pencils had been exclusively manufactured by the carpenter's guild which meant there was next to no competition and as a result pencil quality suffered. Napoleon ordered a restructuring of the city, and stripped the Carpenter's guild of their right to produce pencils. Following this restructuring Froescheis established the Lyra brand as a pencil manufacturer. The Lyra brand is represented by the instrument of the same name - the Lyre is a Greek invention that symbolises art, lifestyle, peacefulness and a creative life. All Lyra's products strive to meet this benchmark for a quality art product that improves your creative life. Over the past two centuries, Lyra has become one of the oldest and most prolific pencil manufacturers in the world. In the early 1900s their factories were producing over 1 million individual pencil per week! The brand is known not only for its excellence in quality but also for its innovation. With products like the Groove pencil, Lyra revolutionised pencil design and functionality. In 2008 Lyra became part of the Fila family, and joined other notable art supplies manufacturers such as Giotto. Since this merge the company has seen even more success and has expanded its range, using more efficient manufacturing methods while keeping a close eye on the environment. See below for information about the Lyra products that we currently stock. 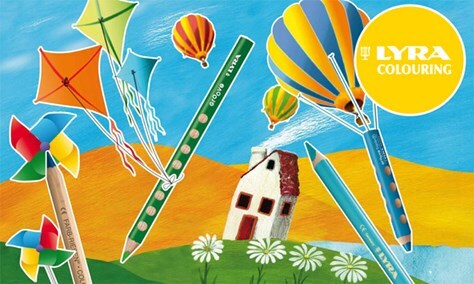 Young artists will have free rein on their creativity with the Lyra Groove TripleOne coloured pencil! This giant pencil is made of three leads all rolled into one, so you are free to use it as a coloured pencil, wax pencil and watercolour pencl all at the same time! Each pencil is housed in a strong barrel of the finest Californian cedar that has been shaped into a triangular cross-section. This triangular design and thick diameter of 15mm make this pencil easy to use by even the youngest artists. Comfortable to hold, their ergonomic design goes even further to include a unique grooved design to facilitate a firm, yet easy grip. The anti-slip holes along the sides of the pencil allow the users' thumb, index finer and middle finger to sit comfortably along the sides of the pencil. These holes remain even when the pencil has been sharpened. Lyra Ferby and Super Ferby Graphite Pencils are a brilliant choice for younger or left-handed artists. These chunky pencils have a 10mm diameter and a triangular shape to make finding the correct grip super easy. This ergonomic design allows for hours of tireless drawing! Each pencil has a wood sealed end and an extra thick, break-resistant lead. The Ferby and Super Ferby are identical, apart from their length.The Ferby pencil measures 12cm in length and has a slightly slimmer nib with a diameter of 6.3mm. The Super Ferby is longer at 17.5cm and the lead is a little thicker at 6.3mm in diameter. Both pencils are available in HB grade. The Lyra Groove is a giant coloured pencil which is ideal for children who are making their first foray into art.The barrel of the pencils, measuring 17.5 cm in length, is triangular in cross-section, with a 10 mm diameter. There are small holes made along the side of the barrel to ensure comfort and an easy grip, and teach children the most effective way to hold their pencils. The grip is very intuitive; the thumb, index finger and middle finger fit into place around the pencil regardless of whether the child is right or left handed. Even after sharpening, these guides can be used! The pencil lead has an extra-wide diameter or 4.25mm and is break resistant and long lasting. The rich pigments used help to produce bright intense colours. These coloured pencils are essential for any imaginative drawing and are a sure grip for a great start! Lyra Groove is simply unbeatable at colouring-in, and is immediately recognisable thanks to the breathtaking design. Everybody wants one! The Lyra Groove Graphite Pencil has a large, ergonomic, triangular shaped barrel. Their design makes them an excellent choice for children or those who are making their first foray into art. The barrel of the pencil measures 17.5cm in length, has a triangular cross section and no added synthetic substances. There are small holes made along the side of the barrel to ensure comfort and an easy grip; teaching children the most effective way to hold their pencils! The grip is very intuitive; the thumb, index finger and middle finger fit into place around the pencil regardless of whether you are right or left handed. These guides can even be used after the pencil has been sharpened! Each pencil also has a small area at the bottom of the barrel where a name can be written on. There are small holes made along the side of the barrel to ensure comfort and an easy grip; teaching children the most effective way to hold their pencils! The grip is very intuitive; the thumb, index finger and middle finger fit into place around the pencil regardless of whether you are right or left handed. These guides can even be used after the pencil has been sharpened! Each pencil also has a small area at the bottom of the barrel where a name can be written on. The Super Ferby is the next generation of Lyra's Ferby coloured pencil range. The Super Ferby range offers young artists an incredible burst of colour! These chunky pencils have a triangular shape, making it easy to find the correct grip. Their easy grip means that you can draw in optimum comfort even during the longest colouring sessions. These pencils have a wood-sealed end and offer highly-pigmented colour from their extra-thick, break resistant lead. The pencil lead measures 6.3mm in diameter.